We’ll report in a few weeks on the final total, but for me it was just as important that everyone had a good night – and from what I could see – they did! Compere Pete Emmett was not only a class act, but great fun and a wonderful guy – humble, well organised and hilarious – all rolled into one! Jan Molby and Josh Daniels were both excellent too – engaging with the audience and Jan constantly available for photos, autographs and even helping out with the auction. Thank you to those 3 guys – you were all brilliant. The hotel and staff too were perfect to be honest – with nothing too much trouble. Thank you to John Lee and Jeremy Hoyle for such hard work over the last few months – it’s been great fun organising this event with those 2 and Jeremy has put in hours and hours of hard work into this event. And we were blown away by the generosity of the sponsors and prize donations. Thank you to everyone who came along and to especially to those who put forward serious sums of money via the auction. Everyone who paid for a ticket, bought a raffle ticket, paid for an auction item or bought a wrist band – I hope every single one feels good about what they did – you deserve to feel proud in contributing to a class night. I want people to know how they money they generously conribute is being used so for anyone who hasn’t read it, here is an article I wrote in December about how the funds for The Huw Thatcher Trust are being used. Those who successfully bid for auction items but have yet to arrange final payment and collection etc please contact Jeremy Hoyle by text on 07799338666. Some of the things that were special for me included 2 groups each bidding many hundreds of pounds against eachother for a Sky Sports Rugby Leauge Experience day – it resulted in Mike Stephenson (Stevo) the Sky Sports face of rugby league throwing another one in the pot so both bidders could take one each and double the money raised. I spoke to Stevo afterwards – a true gentleman. Another highlight was talking to Jon Stead – former Huddersfield and Blackburn centre forward – now with Bristol City. We talked about the times Huw went to Jon’s Mum’s nursery 15 years ago – and how Jon always seems to score when he comes up against Cardiff City. Huw and I laughed about that a lot in years gone by! Then there was 2 separate bidders who both bought a framed Huddersfield Town and Cardiff City signed shirt respectively- with ‘Huw’ and ‘Thatch’ on the back. Then both bidders immediately donated them to Huw’s Hepworth United team mates. I will find out who both the generous bidders are and thank them personally. A moving and superb gesture by each of them. There were sales of football shirts – some as much as £650 – others for smaller amounts but just as generously purchased by people who I hope took away things that they were pleased with. 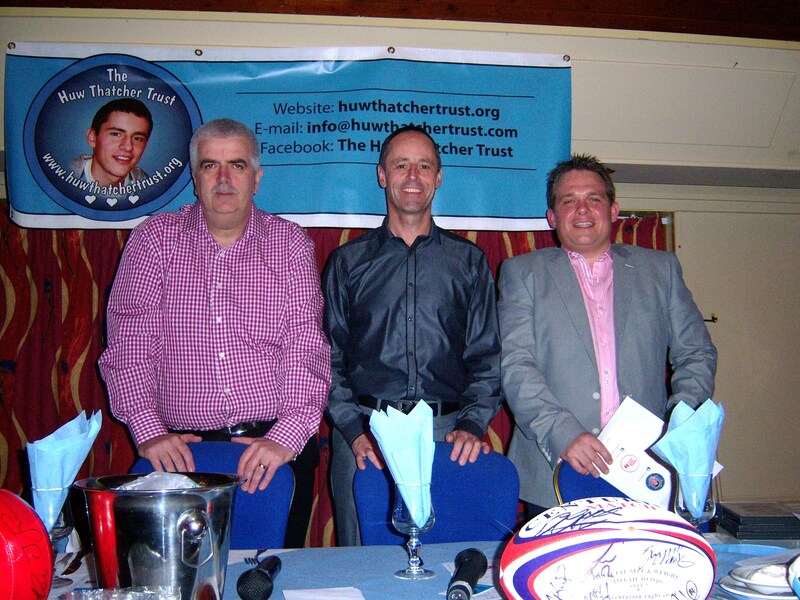 They all contributed to a night that saw the Huw Thatcher Trust fundraising effort go past the £50,000 mark. Even better than that was seeing so many friends – supporting Huw and having a nice time. I loved spending time with friends (old and new) on the night. But the best part of the night was experiencing the clearly articulated feeling for Huw – the feeling of love and compassion for the lovely young teenager who will always be Hepworth United’s 12th man. Thank you and great respect to everyone involved in the night and everything else that people have contributed over the last 12 months – it means so much.